Another book by Harper Lee?!?! That is so exciting! I may have to look for place to pre-order it right now, and spend the next few months waiting in suspense. Thanks for sharing! I noticed the sparkles. :) Those blues are lovely. Ha, I know...usually it's hard to pick favorites from a beloved series! I'm curious to see which Anne books will be my favorites after I've read them all. Phil Gordon was an awesome character! Anne of the Island is my hands down favorite of all the Anne books!! The cover is lovely! I honest to goodness just finished To Kill a Mockingbird this morning. And love the sock yarn. :) Where did you get it? Did you like To Kill a Mockingbird? It was so different from what I expected it to be, but I loved it. :) The sock yarn is from Quaere on Etsy. It's her sparkle sock in the River Bed colorway. I found it during her Labor Day sale last year! Hmmmm.... Loveliness. I may be checking that shop out! Your sock yarn is beautiful. I will have to look into that book series. It sounds interesting. I hope Harper Lee's new book will be good! I'm just reading the series through for the first time and loving it (I had only read the first book before). The Anne books are my favorite, and I NEED to read To Kill a Mockingbird again before Lee's book is published. I love the socks you're making! The yarn is so pretty with the little sparkle. Thanks! I like the sparkle in the yarn, too. Wow, hadn't heard about Lee's next book! I'll try not to be pessimistic. I'm afraid that most sequels tend to be flops in comparison to the first book. Yes, that's the case sometimes, unfortunately. And the circumstances are so strange with this one, too...I just hope it will be good! It was good. :) The ending was so sweet! It pretty much made up for the sad, awkward other chapter involving Anne and Gilbert. I bought a socks from the toe up book and will hopefully be attempting my first pair of socks soon. I picked toe up after lots of reading about how socks are made! Hope I like it! Yay! I hope you'll like knitting socks. It's really not as hard as some people make it out to be. I had heard things like, "Turning the heel is so difficult!" 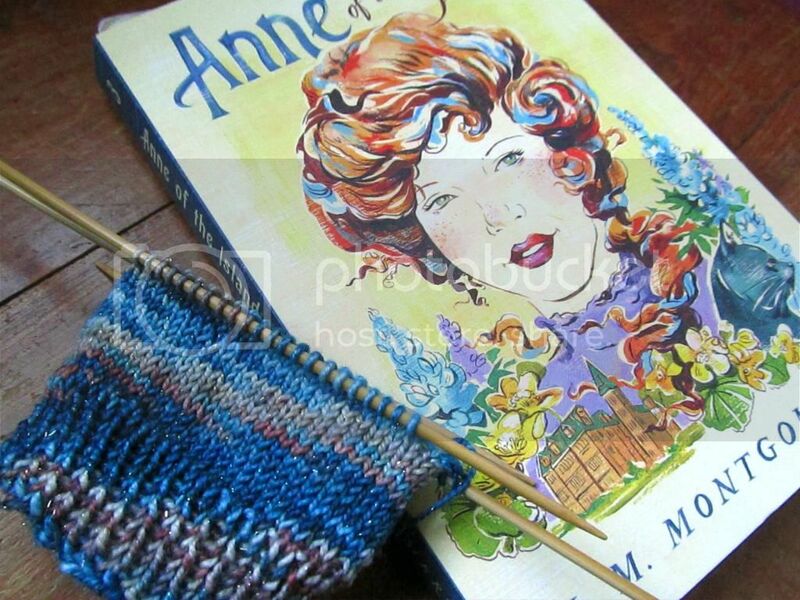 or "I've been knitting for 100 years (slight exaggeration) and I've never tried to knit socks." But I was surprised by how simple it can be. so I finished a Walk in the woods (actually loved the writing and first half but then it got oh so boring!! super bummed) and now reading book 1 of the Anne of Green Gables series. Our reading lists are becoming weirdly similar haha! Ha. :) I didn't like A Walk in the Woods very much, honestly, but thankfully I really enjoyed Notes from a Small Island! Have you read the Anne series before?